Outstanding range of tones and contrasts in this strong composition...Beautiful work! 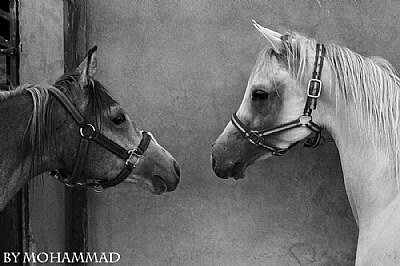 Absolutely excellent horse portrait, I like a lot the way of popsite faces right and left, black and white and a mood of....a small conversation! :-D Excellent shot Mohammad! Gee, I wonder what they are talking about. This is priceless. Nice capture.